Ceramics from the Field Museum's Java Sea Shipwreck collection being analyzed by portable X-ray fluorescence. Credit: (c) Field Museum. Photographer Kate Golembiewski. About eight hundred years ago, a ship sank in the Java Sea off the coast of the islands of Java and Sumatra in Indonesia. There are no written records saying where the ship was going or where it came from—the only clues are the mostly-disintegrated structure of the vessel and its cargo, which was discovered on the seabed in the 1980s. Since the wreck's recovery in the 1990s, researchers have been piecing together the world that the Java Sea Shipwreck was part of. In a new study in the Journal of Archaeological Science, archaeologists have demonstrated a new way to tell where the ceramic cargo of the ship originally came from: by zapping it with an X-ray gun. "It's amazing that we can pinpoint the production area of materials from an 800-year-old shipwreck," says Wenpeng Xu, the study's lead author, a graduate student at the University of Illinois at Chicago, which has a joint graduate program in Anthropology with the Field Museum. "It helps us learn the details of trade relationships—knowing how people interacted in the past is very important for us to understand the present." 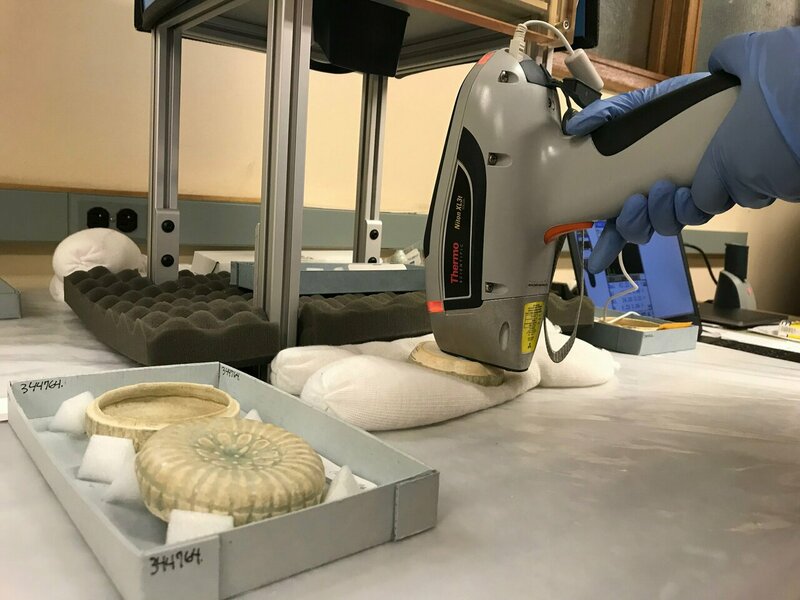 The Field Museum is home to an estimated 7,500 pieces of cargo recovered from the wreck, including the 60 ceramic pieces from the shipwreck analyzed in this study: bowls and boxes made of porcelain covered in a bluish-white glaze called qingbai. Based on the style of the ceramics, scientists knew that it came from southeastern China, but style alone isn't enough to pinpoint a piece's origin because many kilns produced similar-looking pieces. By comparing the chemical makeups of ceramics from the wreck and from different kiln sites in China, the researchers were able to more precisely determine where the ceramics were made. Ceramics from different sites have different chemical compositions because of variations in the elements present in that region's clay or in the recipes that potters used to mix their clay. If a piece of pottery from the shipwreck matches the pottery found at an archaeological site, it's a pretty safe bet that the pottery originated there. "Each kiln site uses its own materials and ingredients for clay—that's what makes each sample's fingerprint unique," explains Xu. "If the fingerprint of the sample matches the fingerprint of the kiln site, then it's highly possible that that's where the sample came from." This is where the X-ray gun comes in. "We used a portable X-ray fluorescence detector—it looks a lot like a ray gun," says Lisa Niziolek, Field Museum Boone Research Scientist and co-author of the study. The science behind the compositional analysis is complex, but Niziolek breaks it down: "You're shooting X-rays into a material you're interested in. It excites the material's atoms. Energy goes flying out, and this measures that energy. Different elements have different signatures of energy that comes back out." Knowing the precise origins of cargo on the ship reveals the size and complexity of trade networks at the time. The ceramics in the study were created over 2,000 miles from where the ship sank—about the distance between New York and Las Vegas. "A key that's emerging is that the shipwreck tells us that there were huge trade networks in the 12th and 13th centuries," says Field Museum MacArthur Curator of Anthropology and study co-author Gary Feinman. "We're taught to associate vast trade networks with Europeans like Magellan and Marco Polo, but Europeans weren't a big part of this network that went from Asia to Africa. Globalization isn't just a recent phenomenon—it's not just Eurocentric, not just tied to modern capitalism. The ancient world was more interconnected than a lot of people thought." "People often refer to shipwrecks as time capsules, but the Java Sea Wreck is more than just that," says Niziolek. "A time capsule represents a moment frozen in time, but that ignores the way these results reveal these vast and changing socioeconomic networks." Feinman agrees: "It's almost the opposite of a nice, bounded time capsule, it's more like a window that opens up to a wide horizon and tells us how this material came onto this ship before it sank."